Looking to downsize from a traditional, large suburban home and embrace a dynamic, urban lifestyle? Downsizing can be exciting but also daunting. With years of accumulated possessions, how do you make this transition and decide what to keep and what to let go? In general, a lighter color palette will make a space feel brighter and larger, while a darker hue will create a moody, intimate feel. This doesn’t mean shy away from color though; build off neutral backgrounds, use them as a foundation and select bolder and brighter hues to add life to a space. For the home finishes at Pier 4, we selected neutral color palettes, rich in texture that have a calming feel to create an expansive sense of space; the timeless nature of the design allows each owner to easily personalize their home. Be objective in your decisions on what to keep and what to purge. Does it add value to your life and do you love it? Would you buy it for your home today? By focusing on a handful of elements, we are not living with less, but rather elevating their importance. By drawing attention to shape, color and the texture, we can, by intention, choose clarity and calmness. Group objects with a similar theme, shape or tone; curate your collections so that they tell a story about yourself, a place or personal interest. Don’t be afraid to experiment and play. The right statement piece will add visual impact and inspire the rest of the room’s style. This could be a piece of art, unique furniture, decorative lighting or an amazing wall finish. The saying “if everything is special then nothing is special” is true, so think about investing in standout pieces; and don’t worry about trends. Whether you should embrace or ignore any trend is really about your personal preference or style. Consider the proportions of your new home; refer to floor plans and measure your existing furniture to ensure it will fit in your new home. When it comes to scale, many people assume that in a condominium this mean everything should be smaller, but that is not necessarily the case. In fact, antiques are almost always too “dainty” looking for today’s modern décor styles. Using a few pieces that are oversized, like a large armoire, a big coffee table, and generous lamps, make a room look expansive and luxurious. 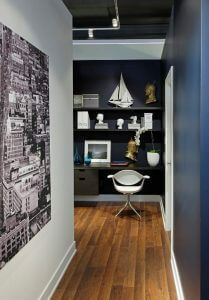 Add functionality and interest to your interiors with creative organization. Bookshelves that are built-in to what normally would be a bare wall can make any space into an instant library; the vertical nature of bookshelves have the additional benefit of making the room feel taller. Consider fitting closets with organizers and take it further than simple wire shelves – add a touch of retail luxury with customized wood cabinetry. Remember you are creating a lifestyle for yourself! Lighting plays an important role in creating ambiance and setting the mood. Combine a mixture of multiple lighting sources to create and control just the right feel. 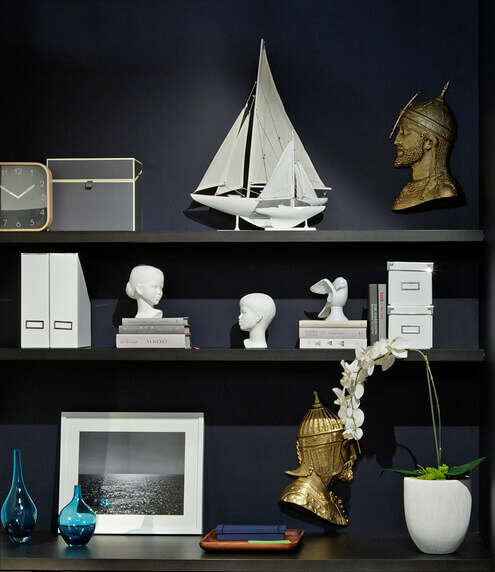 Think in layers, incorporating a range of fixture types, heights and locations while paying special attention to highlighting favorite objects (i.e. artwork) and creating vignettes. When lighting is done well, you don’t even notice it…when it is done poorly it is an assault on your senses. The homes at Pier 4 have been specifically designed to highlight water views and create a sense of tranquility. Show off these views, don’t obscure them. An abundance of natural light will make your home feel warm and inviting and the connection with nature will positively affect your mood. Incorporating reflective surfaces in your home, mirrors being an obvious choice, will increase the amount of light in your home and visually expand your living space.